While there are lots of collaboration tools out there, email still remains one of the most preferred modes to communicate with in distributed teams. While development teams are closest to using team foundation server, you may find that support or operations team may not be familiar with the functions of team foundation server especially if these teams have other tools they use to manage their work. In this blogpost we’ll learn about an open source tool called Mail2Bug. Mail2Bug is a service that allows you to create a bug from an e-mail thread simply by adding a specific recipient to the mail thread. It also keeps the bug up-to-date with information from the mail thread by adding any subsequent replies on the thread as comments to the bug. Bug2Mail is a tool that’s been long used by Microsoft internally, you can read the announcement on it being open sourced on Brian’s blog here. Once this has been completed, upload the process template into tfs using the process template manager and create a new team project using the new process template. Call the team project - Fabrikam. The Mail2Bug tool requires that an exchange or office 365 account. For this blogpost we’ll be using an exchange account mail2bug@fabrikam.com. Ensure you have the password available for this service account. Make sure user account Mail2Bug has access to project level information and work item create permissions on the fabrikam team project. This can easily be done by adding the user to the build administrators group in the fabrikam team project. Ensure you have access to log in to the server where you intend to run the mail2bug service from, the server should have firewall exceptions in place to successfully connect to team foundation server. This can be validated by browsing to the fabrikam web access page from the server. Ensure that the user used to run the mail2bug service has permissions to the fabrikam team project to view collection level information. This can be done by adding the user to the build administrator group in the fabrikam team project. <!-- EWSByRecipients is the most straight-forward way to set up the mailbox. CacheQueryFile - If a work item is not captured by the query, new messages on the thread that created the item would create a new item instead of appending to the existing one. The standard set up is to provide a query that pulls all the items created by the mail2bug service account (regardless of state). To create the query file, just create the query in a visual studio and save it locally to a file. Place the file where the other configuration files are and put the path to that file in the CacheQueryFile setting in the config. User - The user that will be used to run the mail2bug service should have permissions to create work items and view project level information in the team project. The password file being referenced in the config file should be generated using the DPAPI tool by running the command prompt as the user account. The configuration has setting to enable disable sending acknowledgment emails, this is a great way of knowing whether the email thread has been successfully configured by the Mail2Bug service. The email response can also be templated using HTML, I’ve used the following format for the response email. Of course, you can get more creative and instead of just having [BUGID] you can prefix this with the collection name to form the bug url. Manually trigger the execeution of the service by running the command line using the account that will be used to run the mail2bug service, trigger the mail2bug.exe. Follow the log file for any warnings and errors. If the set up and configuration is correct, the service will start monitoring the mailbox. Send a test email to mail2bug@fabrikam.com mailbox, the console should log a new message has been found. Once the message has been processed it will be moved to the deleted folder and a new work item will be created under the fabrikam team project. The work item is generated in the fabrikam team project, the default values specified in the config file are set and the rest of the values are populated from the email message. The origional email is attached to the work item in the attachment tab. The custom filed conId that we added after customizing the process temaplate is also updated. This field should not be modified manually. 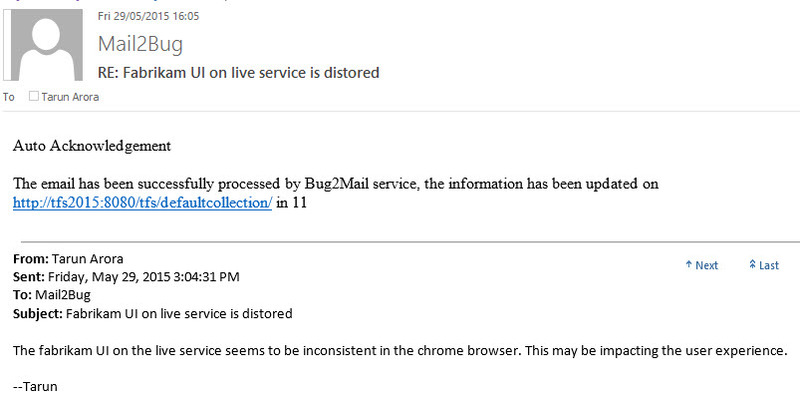 The Mail2Bug service send back an acknowledgement email to confirm that a bug has been created. Further communication on the email (as long as the mail2bug email address is in the to or cc line) is automatically appended into the work item discussion area. Once the service set up has been validated by manually triggering the workflow, the service should be set up to run as a scheduled task on the server. The service offers other interesting features as well, for example, you can link work items by using the format ‘!! !work item #1234’. Simply put, the idea is to reduce friction and effort. Ever been on an e-mail thread where some issue was discussed, when at some point someone asked you to “Please open a bug for this issue”? Mail2Bug tries to reduce the effort associated with that scenario by allowing you to easily create a bug with all the information from the thread with the simple action of adding the relevant alias to the thread. It also keeps the TFS item up to date with any new information from the thread, making sure that information is not lost and is easy to find by looking at the bug. Another common scenario is for support organizations - for automatically creating a ticket for incoming emails, and keeping further communiations on the email thread updated in the ticket.